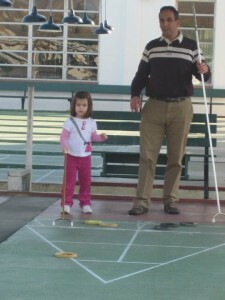 I really wanted to learn now to play shuffleboard, the right way. Christine outfitted us with poles and disks, drew the scoring triangle on the chalk board, and gave an overview on how to score. She glassed the court for us, which involved spreading microscopic glass beads across the court’s surface to make the disks slide faster. 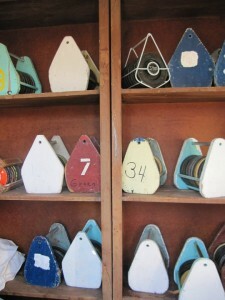 These colorful disk caddies charmed me. 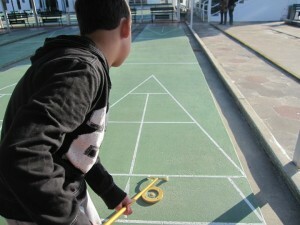 There is some skill involved in shuffleboard; you have to put the right amount of force behind your shot so the disk goes far enough, but not too far. Another important aspect is strategy, and knowing how and when to knock your opponents’ disks off the court. After a few frustrating shots, I was hooked. I wanted to get my game back. A match is usually three games. Whoever wins two games first wins the match. We didn’t make it that long; The Girl wasn’t cooperative. She played for a while, climbed up and down the steps of the grandstand, then told us it was time to go. The Boy, at 10-years old, enjoyed the game and would have stayed longer. The clubhouse bears mentioning, as an Art Deco landmark building with a lot of timeworn charm. Scenes from the movie Cocoon were filmed there. 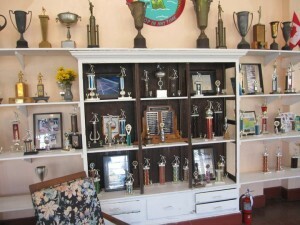 I could have spent hours poring over the pictures on the wall of club members from decades ago, as well as the wall of trophies from as far back as 1934. 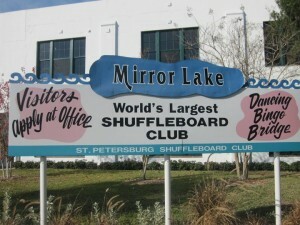 Like more commonplace sports, shuffleboard has its competitions, and its “stars.” Florida Shuffleboard Hall of Fame members Carl Spillman and Mae Hall both represented Mirror Lake as their home club in many local, state, national and Masters shuffleboard championships in the early ‘60s. Years ago the club was a local recreation hotspot, hosting social activities such as dancing, card parties, movies, music and more. 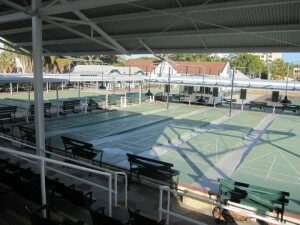 Today, with membership back up into the hundreds, shuffleboard is the main attraction, but the historic St. Petersburg Lawn Bowling Club shares the grounds, and the Chess Club uses the historic clubhouse. In my heart, I rate this special place a 10. It’s an endearing example of historic preservation moving in the right direction. If I lived in the area, I would become an annual member. But factoring in the kids’ point of view, our consensus is an 8. If you come to Florida via I-95 through the Space Coast area, you would probably enjoy a visit to the Liberty Bell Memorial Museum in Melbourne, Florida. Guides proudly point out a collection of uniforms and items from every war America has fought in, and the centerpiece of the museum is a full-sized Liberty Bell that kids can actually touch and “ring” (with a rubber hammer). It makes a delicious BONG sound. The bell was cast in WhiteChapel, England just like the famous Liberty Bell in Philadelphia. FREE admission, donations gratefully accepted. Other attractions on the Space Coast include the Kennedy Space Center Visitors Complex, Astronauts Hall of Fame, McLarty Treasure Museum, and Brevard Zoo. All very kid-friendly and reasonably priced or free. What fun! I am sorry that I missed this now that I hear your description of the day’s events. I want to play next time. Hi Traci… Thanks for stopping by my newly minted blog. I was just in Florida and totally wish I had known about this. But, I will return someday and will definitely check it out. Great family entertainment that is outside and doesn’t involve anything electronic! This is such a fun blog. I am from St. Pete. I have never been. I am too intimidated when they have the Friday night games. So many hipsters. Thanks, Steve! You should definitely try going…don’t be intimidated! Or you could go bowling at Splitsville in Tampa, and see the world’s largest bowling pin! I love the fact that places like this still exist. Thanks for documenting it with photos! 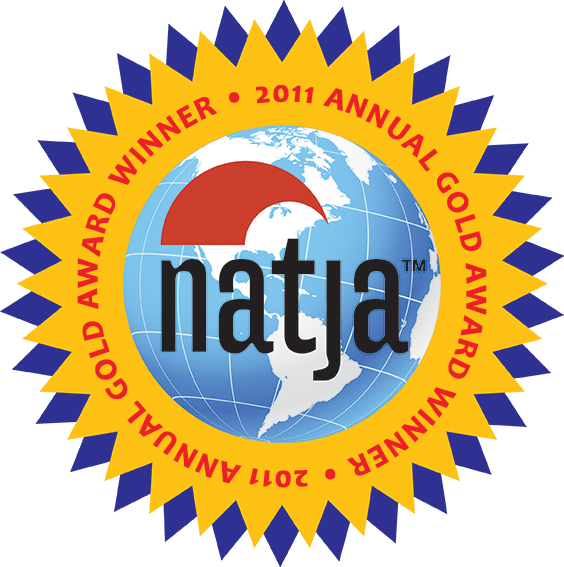 Oh, and thanks again for submitting this article to 6th Byteful Travel Blog Carnival. Be sure to spread the word in any way that appeals to you (retweeting is one of the easiest ways). Hope to see your submissions again next time! My wife’s son turned me on to this “sport” and I have been hooked ever since. He has played at the Mirror Lake facility for many years and still enjoys the Friday nite event. He is so good, and I am so bad, that he plays left handed and still beats me. I just happen to have a court at the house we bought near St. Pete and practice as much as I can. Had to kind of rejuvenate my court with new paint, lines and a wax/sealer but now it plays like a tournament court. Hope to become a shuffleboard tyro one of these days. We have gone many times on Fridays and had a great time. All levels of players and very friendly people everywhere. I recommend this place as a high spot in St. Pete. Thanks for writing and sharing your experience, Bill! I would love to have my own court!